Are you gullible enough to believe Theresa May's latest deception? 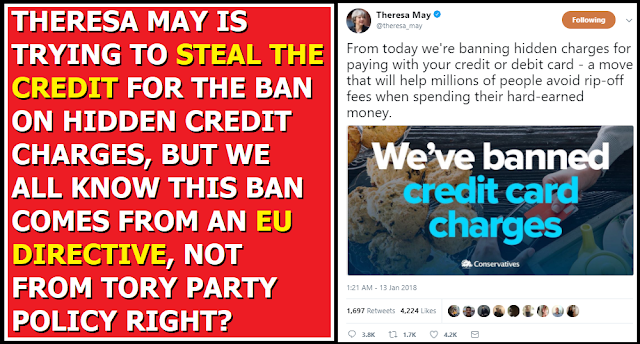 If you ever needed a demonstration of what a pathetic bunch of charlatans the Tory party are, look no further than Theresa May's lamentable Tweet attempting to steal all the credit for the ban on secret credit card charges that is being rolled out across all EU member states. It's important to see this latest credit-pilfering effort from Theresa May and the Tories in context. 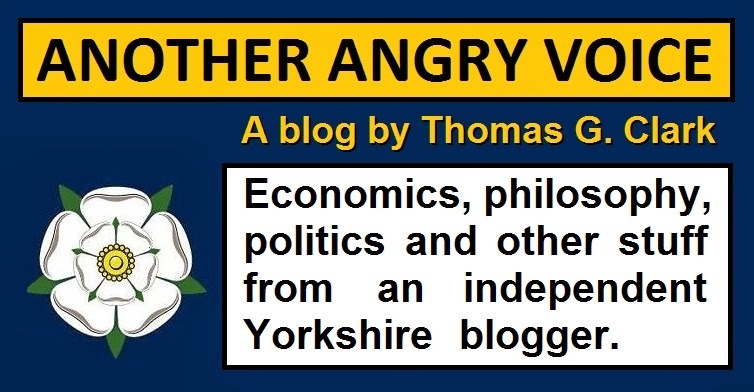 It's absolutely clear that Theresa May turned herself into a puppet of the most rabid hard-right Europhobes in Britain with her ludicrous vanity election. After losing her parliamentary majority and her authority her every move is dictated by the secretive and fanatically right-wing hard Brexit cabal within her own party, by the DUP bigots (who get a veto on her every Brexit move), by Paul Dacre and the Daily Mail mob, and by the fickle hard-right ultra-nationalist Blue-kip demographic who abandoned the wreckage of UKIP to prop up Theresa May's shambles of a government. This disgusting rabble would obviously have erupted in outrage if Theresa May had told the truth; that the ban on sneaky credit card charges is one of the many positive aspects of EU membership. But instead of taking the coward's way out and simply saying nothing about this new legislation for fear of enraging her hard-right backers, May has actually decided to create the absurdly misleading narrative that it's the Tories we should be thanking for the ban on sneaky credit card charges. The absolute brass neck of it! According to Theresa May we should be thanking the party that are making an absolute shambles of ripping us out of the organisation that actually gave us this new consumer protection in the first place! One of the most incredible things of all is that this is the second time in the space of a week that Theresa May and the Tories have tried to steal all the credit for the implementation of EU legislation after they tried to present the extended 5p plastic bag charges as their own policy, rather than the implementation of a piece of EU legislation that Tory MPs actually voted against and worked hard to undermine and obstruct as it made its way through the European Parliament! Just think about the absolute contempt the Tories must have for the general public (you) that they think that they can get away with repeatedly re-branding pieces of EU legislation as their own achievements. They're assuming that we're such a bunch of gullible halfwits that we'll just mindlessly absorb their propaganda without clocking the deception, and that nobody is going to capitalise on such obvious deceptiveness by sharing the evidence they've just handed us proving what an outrageously dishonest bunch of chancers they are.